Our in-house engineers, surveyors and building inspectors can provide you with advice and support at all stages of the development process from land buying, design and build through to customer handover. Technical support is only a phone call away. And out on site, our building inspectors typically carry out over 900,000 inspections at key build stages each year, supporting you in the delivery of high quality, new homes. Get in touch if you have a technical query. NHBC TechZone is the home of NHBC Standards, Building Regulations Plus, the MMC Hub and our technical guidance library. The NHBC Standards set out the technical build requirements, performance standards and provide guidance for the design and construction of new homes acceptable to NHBC. We regularly review and update the NHBC Standards. A full electronic version, NHBC Standards Plus, with additional explanatory notes, videos and 3D models is always available in TechZone. Building Regulations Plus is an electronic version of all the Approved Documents with supplementary guidance notes. Technical Extra is our technical newsletter, providing updates and guidance on NHBC Standards, Building Regulations and compliance. Our MMC Hub is a resource area with our latest research on offsite and other non-conventional construction as well as the current list of building systems which we accept for warranty cover. We make sure you’re kept up-to-date with a range of free publications, invites to industry events and training. Clicks & Mortar is our monthly email newsletter which we send to all registered builders and developers. It features all the latest information on NHBC Standards, Building Regulations, registration statistics, training courses, industry conferences and technical updates to our products and services. We also subscribe you (at no charge) to receive Housebuilder magazine the leading publication dedicated to housebuilders. The NHBC Foundation produces research papers and reports with practical information and guidance on key issues affecting the industry. You can download the free reports here. Building for tomorrow is a UK-wide series of seminars that runs each year looking at the latest technical advances and key issues in house building. Free webinars are provided by our training team on a range of topics. They’re typically 30-45 mins long and run at lunchtimes so as not to interfere too much with your working day. 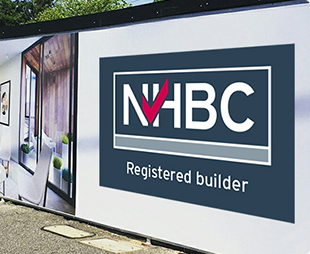 Being registered with NHBC means you are able to use the NHBC logo in promoting your business and your developments. For every site you register with us for warranty, you can request a free site pack which includes a siteboard, flag and van sticker. We also have a range of discounted products and publications available through our online shop. This is an online resource that includes training videos for you and your staff and brochures for customers that provide the key information about our Buildmark warranty and insurance cover. Go to toolkit now.